March Madness went wild over women this year. 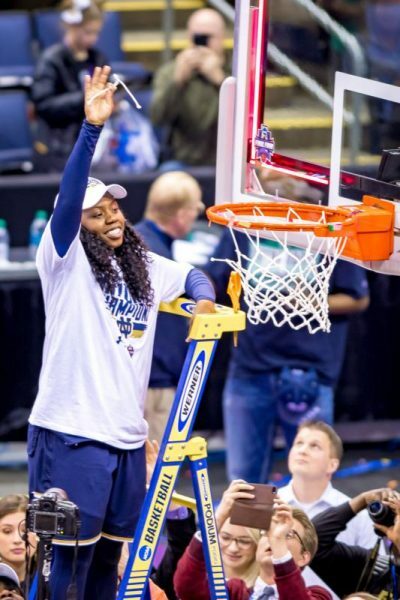 Two women dominated the craziness — Arike Ogunbowale of the University of Notre Dame and Loyola University Chicago chaplain Sister Jean Dolores Schmidt. Even for those who watch little national sports (Me! ), it was difficult to avoid their stories. They showed confidence, strength and zeal and captured the nation’s attention when the men and their brackets usually rule. High school coach and theology teacher Anne Stricherz was still on cloud nine after the spring NCAA tourney rounds. Did you know all the coaches for the Notre Dame women’s basketball team are women? I did not. “Yep! That whole staff is women,” Stricherz said with pride. Women rising to the top in their game does not surprise her. Stricherz coaches women’s golf and teaches in the theology department at St. Ignatius College Preparatory in the San Francisco Bay area. She grew up in a faith-filled family and sports was a huge part of life. Through the years, Stricherz took up running, tennis, swimming, golf and more. She was a rower for Notre Dame, and she’s coached several team sports. All this led her to developing a course called Sports and Spirituality at St. Ignatius. The elective class examines Catholic spirituality through the lens of sports. The Catholic coach said there are many analogies between spirituality and sport, and that spiritual growth has the same requirements as athletic growth. Both require discipline, practice, strength, community and even, at some point, a letting go. For Stricherz, spirituality has that core Ignatian message of finding God in all things — after all she was schooled in Jesuit institutions and she teaches at one. It’s a spirituality that connects to everyday life. Last year, Stricherz published a book to help individual players, coaches and athletic directors (the “shepherds of the shepherds,” she said) bring a spiritual dimension to their play and teams. “Pray and Practice with Purpose: A Playbook for the Spiritual Development of Athletes” gives 30 ways to pray with a team using athletics as a cornerstone for building community. Her favorite suggestion is one she uses with the girls on the golf team. The ritual opens communication, builds community and also lets the coach know what else is going on in the lives of the young women — things that might not have popped up during practice or competitions. It’s a moment of grace after a week of work, sweat and exhaustion. Stricherz recalls one such prayer session that was a bit more intense than usual because of some weighty experiences shared by a few of the golfers.